Bagged vs. Bagless is a big debate, but which one is better? That is the question I want to answer in this post. I’ve broken it down into the good, the bad, and one more option you might not have thought of. So if you’re considering to go bagged or bagless then check out what I have to say below. Perfect for people with allergies – If you suffer any allergies then a good strong bagged vacuum is your best bet. You got to make sure it has a good HEPA filter and not the knock off ones, and also make sure it’s a sealed system. If you don’t have the real deal HEPA filter or the vacuum is not sealed up then you’ll just be dumping the allergens back into the room. Doesn’t fling dirt and dust in the air – When you empty the container of a bagged vacuum you just remove the bag which lowers the chances of the dust going back in the air. Works best for Pet Dander – Since a bagged sealed-vacuum will be less likely to throw dust back in the air it will also be less likely to throw pet dander and even pet hair back in the air. Once again, sealed bagged vacuum is a must if you have allergies. A lot of them last for a long time – One common trait I see with people who have bagged vacuums, like the ones you buy at the vacuum stores, will have them for a long time. Some models last so long that it often makes sense to buy them used since you know it will last. If you keep having to buy a new vacuum too often, then you might want to consider a bagged models and read our “Learn More” option below. Can go longer between emptying – My favorite feature is that the bagged vacuums can go longer before needing to be empty. For the bagless vacuums, I often empty it after every cleaning. Local Shops – Many local vacuum repair stores often sell vacuums too. The vacuums you get there are the better options, and you have someone to talk to about your exact vacuuming needs. Plus, it’s nice to have a place to go if your vacuum needs repair. Often quieter – I hate loud vacuums, so much so I did a post on it here. The vacuums I see being the quietest usually have a bag. Often easier to clean – Since you have a bag to collect most of the dust, it can be easier to clean a bagged vacuum. You’ll still have the issue of cleaning the beater brush and other parts of the vacuum, but the area that traps the dirt should be easier to clean up. Some lose power as the bag fills up – As the bag fills up you’ll find that many bagged vacuums will lose suction. Annoying when you’re in the middle of cleaning. Have to buy bags – The bags are not badly priced, but this is not something you have to worry about with bagless vacuums. Bags can feel dirtier when emptying – Some people think that emptying the bag is a dirtier experience than a bagless vacuum. I can see this point because some bagless vacuums have the release that dumps the contents out from the bottom, so you never touch any of the dirt. But with bagged vacuums, you have to touch the vacuum bag which can feel nastier in comparison. Less Hype on TV for them – No one seems to be talking about bagged vacuum cleaners the TV. Not really a problem for some bagged vacuum manufacturers because their reputation spreads the word just fine for them. Door to Door Salesman – Can you believe there is still door to door salesman, and a lot of them sell vacuums? You don’t see them selling bagless ones, just the expensive bagged models. I prefer going to a vacuum retail store and see all the other models and not the one the door-to-door salesman is trying to sell. No bags to buy – you have no bags to buy, and some see it as a more ECO-Friendly option since you’re not throwing away any bag. 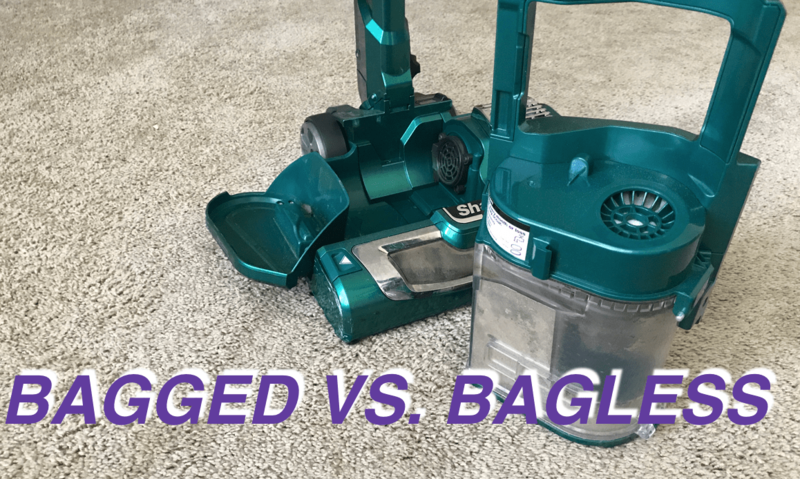 Can be cheaper – Being cheaper is the biggest thing that bagless vacuums have going for themselves. Lighter – Bagless vacuums can be lighter due to them needing fewer things like bags and other must-haves like a sealed system. Easy to see when it’s time to empty the contents – No bag in the way so you can see when it’s time to empty the canister. Some bagged vacuums will have a gauge to let you know how full it is but I like seeing the actual dirt in a bagless vacuum to let me know how full it really is. If I had to buy a Bagless Vacuum I would go with the Shark Rotator Powered Lift-Away Speed because of how useful it is for cleaning the home. Can throw dirt and allergens back in the air – Since you just dump the contents out you run the risk of some of that dirt and allergens to go back in the air. With a bagged vacuum you throw the whole bag away lowering the chances of spreading the dust. Don’t seem to last as long as bagged vacuums – I’ve had some bagless vacuum cleaners last a good long time, but none seem to last as long for me as bagged vacuums. I think it has more to do with the psychology of it, the more expensive the vacuum, the more likely you’ll take care of it. Or the bagged vacuums are made to last? Who knows, but find out for yourself in the learn more section below. Often short changed – to keep cost down the cheaper bagless vacuums will lack things like a long power cord or even a long hose. I remember when I got my first vacuum for my first apartment, it was one of those cheap department store vacuums. I didn’t know any better at the time. When I would go to clean the 1 bedroom apartment, I noticed that I had to unplug to be able to clean the whole apartment. Only later when I got a good vacuum cleaner did I love the fact I could vacuum the whole place without having to unplug. Buy a cheap vacuum get short changed on the stuff that really counts. The best option is to get a bag vacuum that you use for your everyday cleaning and then a shop vacuum for all the tough messes like spilled drinks, glass, and whatever other messes you’ll run into. And you’ll run into plenty of messes if you have kids or pets. Having these 2 vacuums can be the best bet especially if you have a family with pets. So much so that I wrote a post on it here. If you want a good read then check out this Reddit post from a Vacuum Repair Tech and what they think about the different types of vacuums to buy. Want to blow your mind more? There are more options like a Water Filter Vacuums that we talk more about here.